This Chorizo Risotto is my trump card when I haven’t had time to go shopping yet need a quick recipe that delivers the goods! As long as there are some chorizo slices in the fridge, it’s a winner of a dish that you can make in no time. Not only is it so simple, but it’s delicious served with fried prawns, with fish, with chicken, or just on its own with a few greens. It’s handy and versatile for a quick and rewarding family dinner, or for when friends pop in at the last minute, as the ingredients are usually always at hand in the fridge or in our cupboards. I remember having a much more sophisticated version of this chorizo risotto a few years ago in a chic restaurant in the Champagne region. The dish was so elegant, served with a filet of the most buttery, flaky fish on top, and the sauce was served apart, which was quite a revelation to me for serving a risotto! It was so mousse-like that I’m sure it was prepared using a Siphon. While its flavours played in my mind, I couldn’t resist trying out a simpler take on it at home, serving the chorizo sauce around the risotto. After experimenting happily on the family over the years, here it is – et voilà ! Oh, so chic yet easy. First make the chorizo sauce: In a small saucepan, dry fry half of the chopped onion with the chopped chorizo until the onions are translucent, chorizo-coloured and there’s no fat left in the pan. Add about 250ml (9fl oz) of the stock, boil then leave to simmer until the sauce reduces by a half. Make the risotto: Heat the olive oil in a large pan and sauté the other half of the onion until translucent. Add the risotto rice and toss in the oil and onion also until translucent then pour in the wine. As soon as the wine is absorbed, add a large ladle at a time of the HOT stock and stir until the stock is well absorbed by the rice. Repeat this for 15-20 minutes or until the rice is cooked. Add the butter, parmesan and chopped parsley. Add the cream to the chorizo sauce 5 minutes before the risotto is ready and continue to simmer. Blitz the sauce with a hand-blender if you like it smooth, otherwise keep the chorizo pieces in. Keep the sauce warm until ready to serve. If serving with prawns, in a small frying pan, heat the butter just until it browns slightly and smells nutty. Toss in the prawns (defrosted if frozen) until they turn pink then, if using, splash in the Pernod and flambé, igniting off the alcohol. Serve the chorizo risotto in bowls, top with the prawns and drizzle around the chorizo sauce. There’s no need for any extra butter to fry the chorizo, as there’s enough fat in the sausage already. Choose either mild or strong chorizo, depending how spicy you like it. I so want to make this! I don’t know if the chorizo here in the US is quite the same as the chorizo in Europe. Only one way to find out! It would be interesting to know if chorizo is different than what we find here in Europe, Christina. 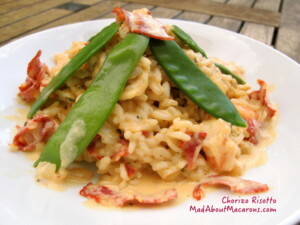 One thing is for sure – you can’t go wrong with it, whether it’s strong or mild since either way the risotto is fabulous! I found a spicy one from Spain at the Italian shop! So exciting! It looks like you blitzed your sauce, right? I may do that but take out the chorizo pieces first. Seems a shame not to get the texture of the chorizo. Making this soon! Made it!! Fabulous, Jill! Thank you for a delectable dinner idea! We both loved it! That’s the best compliment ever. Thank you, dear Christina.